Police officers at the University of Illinois at Chicago complain they were left outmanned and underequipped at last Friday’s chaotic rally where protesters and supporters of Donald Trump faced off in noisy and often violent confrontations. 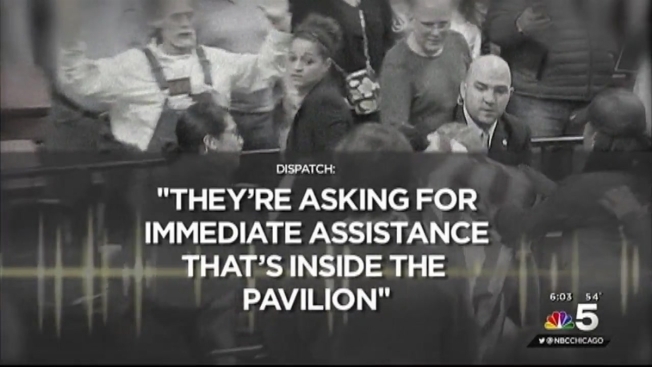 And NBC5 Investigates has learned it is not the first time the union has raised issues about safety, and manpower. Members of the police department declined NBC5’s request for an interview, saying they lacked authorization to comment on the record. But a copy of the letter, obtained by NBC5 Investigates, shows a litany of complaints. In that letter, which was sent Monday, Robinson complains that officers were told to leave pepper spray behind, not to wear protective gloves, and not to place their hands on anyone. After that, he said, officers were told to have Trump staffers ask the individuals to leave, then they were to ask twice more, and inform protesters that refusal would constitute criminal trespass and expose them to arrest. The University refused a request for an interview. But in a written statement, they disputed the officers’ claims. UIC insisted in that statement, that officers could not have used their pepper spray in the confined area, that they were only told not to wear dark gloves, which look aggressive, and that chief Booker was on site and in charge throughout the evening. The University insists officers were never told not to place their hands on anyone, that those instructions were only given to private security officers and the Trump campaign’s own security. Student trustee Jauwan Hall, said he was not concerned about the officers' charges. "I'm pretty sure the UIC police department has a pretty big budget," he said. "I think it's a little bit overblown." Hall said he had personally seen chief Booker in front of the Pavilion the night of the demonstration. "I talked to him," he said. "These officers don't seem to have low morale when I see them on campus," he said. "They look fine to me." Still, NBC5 Investigates has learned that last August, the union raised other safety concerns, about cutbacks in manpower imposed by Booker shortly after his arrival as the new chief.